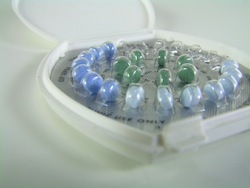 Birth control pills often deliver estrogen to the body in doses high enough to stop ovulation. Some foods also contain estrogen. This brings up the question of foods that could interfere with birth control pills and the effectiveness of those pills. There is no evidence that foods, of any kind, interfere with birth control pills. At the heart of the debate are foods like soy, certain seeds and dairy products derived from cows given hormones. These foods have long been touted as natural means of reducing menopausal symptoms, but there is no clinical evidence estrogen in foods has any impact on health.